The Book of Colossians is a great place to learn more about our Savior Jesus and who we are in Him! It is so powerful and gives us a great way forward in an increasingly dark world. Paul is expressing his happiness at the news update on the growing faith of the Colossians. Being filled with the knowledge of the will of the Lord will displace thoughts of worldly things. Like a drinking glass filled with muddy water that is immersed in a pool of crystal clear water-so is the one who is filled with the knowledge of the will of God! Knowing and living in the will of the Lord goes hand in hand with having wisdom and understanding from Him. Those with understanding are able to apply information to every day living-that is wisdom-applying information rightly. We can and should know the will of the Lord for our lives. We can and should have eyes to see and ears to hear from the Holy Spirit (wisdom and spiritual understanding). These things will help us walk worthy of the Lord. As we walk worthy of the Lord we will be fully pleasing to Him! We will also be fruitful in every good work and truly get to know our Father in heaven in greater measure! We will be strengthened with all might according to His glorious power! Not only will we have patience and the ability to bear up under every struggle-but we will do so with JOY!!! Please meditate on these things and just watch how the Lord works in your life! 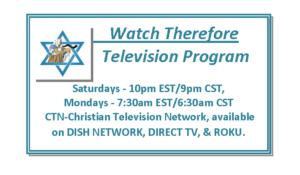 The Watch Therefore television program is really moving forward-thanks to our great Savior Jesus! People are watching now more than ever and many are responding with great letters and testimonies. More are also coming alongside to partner with the prayer and financial needs of the program-Hallelujah-we need all the help our Savior will provide through His people! Currently, I am teaching through the book of Colossians on the program. The teaching I mention at the start of this letter is a snapshot of what I am sharing. Certainly, Colossians will help us watch and be ready! Additionally, I am going to be teaching important prophetic insights from the Bible as they directly relate to this special generation. New opportunities for expansion of Watch Therefore TV are coming in leaps and bounds! I cannot share any more details right now. All I can say is that Abba Father must truly want this message to cover the globe! These new opportunities are far beyond our current capacity-but well within His reach! 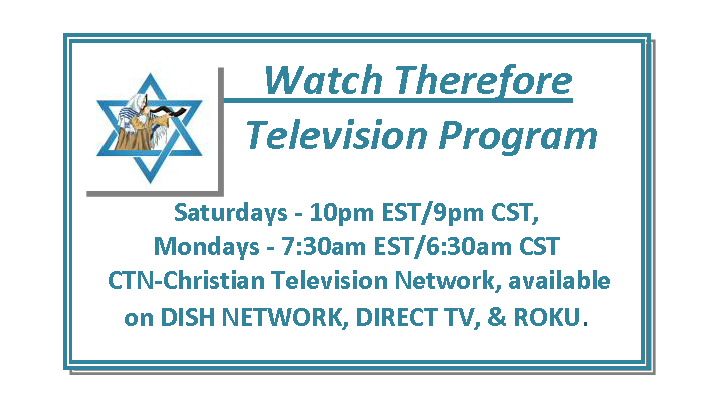 So, please pray for Abba's Kingdom to come and will to be done on earth as it is in heaven as it relates to Watch Therefore TV! Please pray for upcoming opportunities for Nigeria in May and Rwanda and the Congo in September. Truly, if the Lord of the Harvest takes me to these places we should expect many precious souls to be saved and set free! We should also expect many to learn the importance and how to watch therefore and be ready! We are currently partnering monthly by prayer and financial support with two Kenyan pastors who are helping orphans and widows, preaching the gospel, and making disciples of our Savior Jesus. Please pray for Pastor's Zaphania Makori and James Okenda. Remember, more than ever, this is the time to be poured out for the faith of others and to watch therefore and be ready!